Qwiquallaaq/Boat Bay Conservancy protects forested lands, protected bays and coves, small islands, and cliffs, and supports a natural and scenic setting for visitors. The conservancy is located in the Johnstone Strait, directly across from the Robson Bight (Michael Bigg) Ecological Reserve, a reserve that protects key habitat for killer whales and prevents their harassment. The Qwiquallaaq/Boat Bay Conservancy was identified for consideration as a protected area as a result of the Central Coast Land and Resource Management Plan planning process. Following Government-to-Government discussions between the Province and First Nations, the central coast land use decisions (February 7, 2006) confirmed that Qwiquallaaq/Boat Bay would become a conservancy. The area was legally designated as Qwiquallaaq/Boat Bay Conservancy in Spring 2007. The conservancy contains: rustic campground and picnic sites used by small boaters, especially kayakers; a seasonal killer whale monitoring and research camp; and, anchorages at Boat Bay and just outside the entrance to Growler Cove for recreational and commercial boaters. Conservancy Size: 1,375 hectares – 639 hectares of upland and 736 hectares of foreshore. 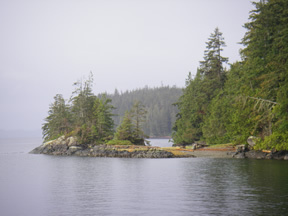 The conservancy occupies the western end of West Cracroft Island in the Johnstone Strait and is 72 km southeast of Port Hardy, 103 km northwest from Campbell River, and 300 km northwest of Vancouver. The Conservancy is within the traditional territories of the Mamalilikulla-Qwe’Qwa Sot’Em, ‘Namgis and Tlowitsis First Nations. Sources of fresh water and protected beaches made the Boat Bay area an important stopover site for First Nations’ journeys requiring travel through the key transportation corridor between the northern and southern Kwakwaka’wakw’ First Nation communities. Marine and terrestrial resources such as salmon, crab, groundfish, wildlife, medicines, berries, and cedar were conveniently available to First Nations travelling through the area. Visitors to the conservancy are often attracted by its proximity to the whale activity and other wildlife in the region. High shoreline cliffs in the conservancy provide excellent viewpoints for observing whales in the strait. The management plan for Qwiquallaaq/Boat Bay Conservancy was developed in partnership with the Mamalilikulla-Qwe’Qwa Sot’Em First Nation and approved by project partners in January 2013.